Worcester manufacturing firms offered many job opportunities but not necessarily employee housing. As industry expanded and the ranks of workers swelled, builders constructed triple-decker housing units near the factories. 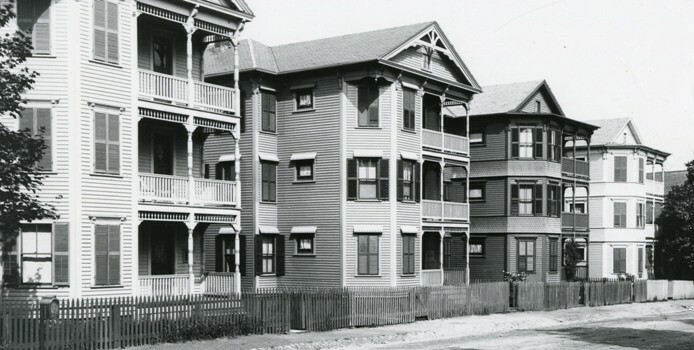 The three-decker was a new building type designed to accommodate several families in a single dwelling. Three-deckers made economic and social sense, as they conserved land and offered affordable housing, and they created dense neighborhoods that fostered a sense of community. We lived, when I was a child . . . in a triple-decker tenement a quarter way up the long hill that was Providence Street. The street belonged to a few Irish, to a few Poles, and to us. The . . . two white houses at the opposite corners of Waverly and Providence Streets . . . [were] the residual islands of a lovely, tree-shaded New England street. . . . These triple-deckers, which straggled up our hill, were mostly sadly in need of paint jobs and their mass appearance was somewhat depressing. But in many other respects they were not so bad. They had balconies, front and back, which we called piazzas. The yards in the back had fruit trees–cherry and pear and apple. . . . The contemplative and withdrawn could sit on the back piazzas and look at the fruit trees; the urban and worldly could sit on the front piazzas and survey the passing scene. . . . Very near the bottom of the hill, on the right, was Cassie McMahon’s house. She was an adorable young girl; her loveliness took your breath away. But she lived in a private house, a house all to herself and her parents, and this made her automatically unapproachable. She was sweet; she nodded and smiled at us, and then went back into her private house. She had no neighbors–that is to say, no other families living in her house to whom we could get close in order to get close to Cassie. She was isolated, which she didn’t seem to mind; but we were isolated, too, and this was grievous. . . .
Saturdays and holidays there was exaltation in going ‘down the line’–the expression we used for going downtown. Past Elkind’s, down Grafton, down Front, past the Common . . . past the City Hall, to Easton’s, at Main and Pleasant. . . . A few streets down from Easton’s was [Elm], where the Worcester Public Library was–an outlet to the universe. . . . A few blocks below that was . . . the Worcester Theatre, where you could behold the [glamorous stars]. . . .